I have never tried a perfume from Yves Saint Laurent but after hearing how hyped up YSL's Black Opium was, I knew I had to give it a try. 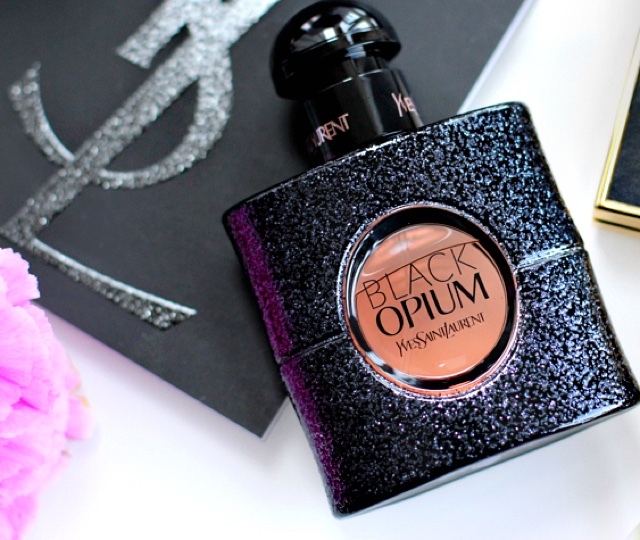 Black Opium Eau de Parfum is a very seductive, evening fragrance which I fell in love with as soon as I tried it. If you enjoy perfumes with warmth and depth you will definitely love this. YSL Black Opium EDP is a gourmand floral fragrance with notes of black coffee, white florals and vanilla. The Black Coffee note acts as a shot of adrenaline whilst the floral notes of Jasmine instantly seduces. The vanilla notes in this fragrance adds lightness, sweetness and sensuality. I personally find this fragrance to be evening appropriate and would be lovely for a night out or a date. The packaging of this fragrance is so luxurious and beautiful. The bottle itself is a black textured sparkle with a clear circle in the middle showing the fragrance - I think this is a great feature so you can see how much product you have left. The logo is embossed on this circle in black font. The lid of this perfume also has the 'Yves Saint Laurent' logo in a silver toned pink shade which I think really lifts the bottle's overall appearance. EDP's generally tend to last much longer on the skin in comparison to EDT's. Even after showering, this scent still lingers on my skin which shows how amazing the longevity is therefore this scent is ideal for a night out because it is guaranteed to last on the skin all night long. This is definitely one of my new favourite fragrances and I would definitely recommend you pick this one up. This fragrance ranges in price from £44-£86 however you can purchase it from the BeautySpin website from £44-£67. If you are hoping to purchase the 90ml bottle you will save £20 just by purchasing it through BeautySpin!! I just received the original Opium from Scentbird and I love it. I have to go and sniff the new Black Orchid. Glad you love it! I've wanted this for a while, mainly because the packaging is so beaut! I am obsessed with this one right now, it's such a lovely scent! LOVE the bottle! Did you find the fragrance sweet at all? Thanks for a helpful description of the scent, I want to try it right now! And yes, like everyone else commented, that bottle is gorgeous! I know, the bottle is beautiful!! Oh I love the packaging. And while I am very picky about scents, this sounds like something I might actually like. I love vanilla scents and the idea of the black coffee scent intrigues me. I must try this scent now!! I've always wondered about this perfume.I see it all the time but have not smelt it. From the notes you listed though, I think I would prefer something a bit more fruity, but I like that this is very sensual. Great post! I am glad that you like this scent..personally it smells OK but I do love the bottle's design!